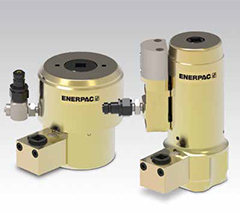 Enerpac introduces a new portfolio of hydraulic bolt tensioners for critical Power Generation fastening applications. Three new bolt tensioner series are designed for maximum durability in harsh environments, ease of use and improved speed of operation. The PGT-Series Double Deck and Single-Stage Bolt Tensioners have a broad range and provide high performance in tight spaces typically found in wind and gas turbines. Key features including auto-retract pistons, over-stroke protection, and auto-engage nut rundown help make the PGT-Series Bolt tensioners fast, durable and easy to use. The FTR-Series Foundation Bolt Tensioners are designed specifically for tensioning wind tower foundations bolts. These bolt tensioners provide the speed and precision required by this critical application. Long stroke models provide greater speed and ease of use by enabling applications to be completed in a single pull. The FTE-Series Elliptical Foundation Bolt Tensioners provide an ideal fastening solution for wind tower foundation applications where limited space between the stud and wall prevent the use of standard tools. They feature an elliptical geometry, which enables fit in narrow access foundation applications without reducing load capabilities. FTE-Series Bolt Tensioners make the perfect “universal solution” that will work on nearly any foundation application, whether standard or narrow access. In addition to the standard Portfolio of Bolt Tensioners, Enerpac is also releasing a series of customized kits designed for critical installation and maintenance applications in gas plants. Enerpac’s experienced team of tensioning professionals provide expert technical support and specialize in creating custom solutions for these unique applications. For more information, please visit http://www.enerpac.com.